Miss Berry sends Mr. Witham a picture and article about one of the dormitories at Berry that was destroyed by fire. She wishes for Mr. Witham to publish the article and picture in the Miami paper to gain attention to the public. She wishes to build a fire-proof dormitory for the 75 boys who were residing there and hopes to open it by the end of summer, but cannot do so without Mr. Witham's help. 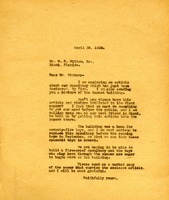 Miss Berry closes the letter by asking Mr. Witham to send a marked copy of the paper that carries the enclosed article.